In April, the busiest month of theater, when all of the last shows rush to open before awards deadlines, what could ever convince me to go back and see a play right after I just had seen it? 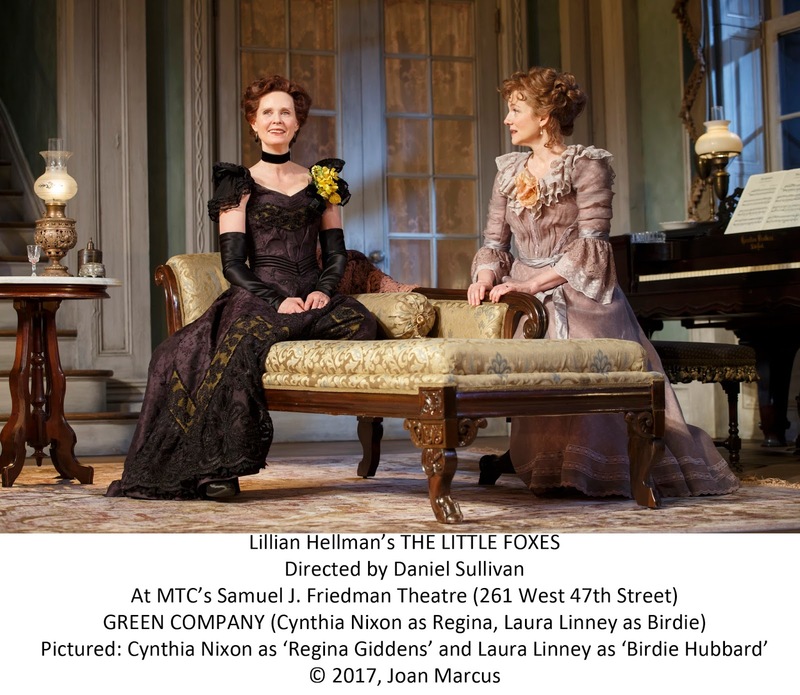 For Lillian Hellman's The Little Foxes, it was the chance to see stars Laura Linney and Cynthia Nixon trade off the roles of Regina Giddens and Birdie Hubbard At certain performances, Linney plays uppity, ambitious Regina, who isn't going to let her brothers, Oscar Hubbard (Darren Goldstein) and Ben (a superby Michael McKean), cheat her out of any of the money from the lucrative deal her family is striking with Mr. Marshall (David Alford) to save their business. Her cold heart isn't warmed either by her estranged and infirm husband, Horace (Richard Thomas), or daughter, Alexandra (Frances Carpanni), who obviously adores her kind father more than her overbearing mother. The girl, in fact, is the apple of the eye of her Aunt Birdie (Nixon), who also has a soft spot for Horace. She has loftier hopes for her niece than the same fate she had forced upon her: to be married for her money -- even if the man who will benefit is her own son, untrustworthy and cruel Leo (Michael Benz). Birdie hides the physical abuse she suffers at the hands of Oscar and urges the girl to get away before it's too late. But then switch! The next performance, Linney is shy, almost-invisible Birdie and Nixon is calculating, manipulative Regina. It's fascinating to watch, not only because the actresses, directed by Daniel Sullivan, so easily produce such different characters, but because of the consistency in the performances of the supporting actors as well. There is virtually no difference in the presentation or chemistry between the women and the others with whom the interact. This is some pretty great acting we get to witness and if you have the opportunity to see both versions, I urge you to do so. Personal preference: Linney as Birdie, which is opposite from the opening-night casting. The two seemed a perfect fit in these roles and allowed for great depth. Jane Greenwood's period costumes take us to the turn of the 20th Century and Set Designer Scott Pask places us in a rich southern manse owned now by the Giddens, but where Birdie fondly remembers an Alabama childhood where things were gentile and sweet. Ownership passed to her husband, however, and now she feels like an unwelcome guest at . Filling out the cast is Caroline Stefanie Clay as family servant Addie. It's a tale of time gone by, greed, deception and some of the worst family relationships you can imagine. It's pretty absorbing and surprisingly contemporary for a play that was written in 1939. And it makes me want to see it again, maybe this time with Bette Davis starring as Regina in the 1941 film. 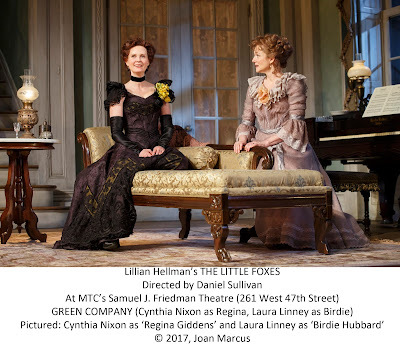 The Little Foxes steal from the hen house at the Samuel J. Friedman Theatre, 261 West 47th St., NYC. littlefoxesbroadway.com.